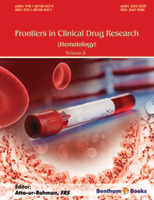 The present third volume of this eBook series: Frontiers in Clinical Drug Research – Hematology comprises six comprehensive chapters covering immune thrombocytopenia, chronic myeloid leukemia, lymphoid and myeloid malignancies, pediatric hematological malignancies, childhood leukemia and erythrocyte turnover and erythropoietic patterns in experimental mouse models of anemia. In chapter 1, Jose Perdomo presents the current understanding of etiology of immune thrombocytopenia for the enhancement and development of existing and new treatments. In chapter 2, Bonifacio and Sorio discuss the recent developments in the treatment of chronic myeloid leukemia treatment based on understanding that BCR-ABL1 oncogene is alone not responsible for the occurrence, progression and maintenance of disease. The emerging role of phosphatases in the pathogenesis of hematologic malignancies as new therapeutic approaches has been discussed. Ota Fuchs in chapter 3, review the role of various immunomodulatory drugs in the treatment of lymphoid and myeloid malignancies. Hematological malignancies arise in blood forming tissue such as in the bone marrow. Diagnosis at the initial stages could lead to the successful treatment and eventually to a decline in mortality rate. It requires a detailed understanding of etiology of disease. In chapters 4 and 5, various aspects of pediatric leukemia has been discussed. Lanka and Pulicherla in chapter 4, focus on the clinical strategies and treatment approaches to combat pediatric hematological malignancies. Natasha Ali in chapter 5 reviews the new therapeutic agents for treating pediatric leukemia including nucleoside analogues, monoclonal antibodies, CAR T cells, tyrosine kinase inhibitors, epigenetic agents and proteasome inhibitors. In the last chapter of this book, Chatterjee and Saxena have compared the erythrocyte turnover and erythropoietic patterns in two different experimental mouse models of anemia. I hope that the pharmaceutical scientists and postgraduate students will find these reviews valuable in order to seek updated and important content for the development of clinical trials and formulating research plans in these fields. I am grateful for the timely efforts made by the editorial personnel of Bentham Science Publishers, especially Mr. Mahmood Alam (Director Publications), Mr. Shehzad Naqvi (Senior Manager Publications) and Dr. Faryal Sami (Assistant Manager).